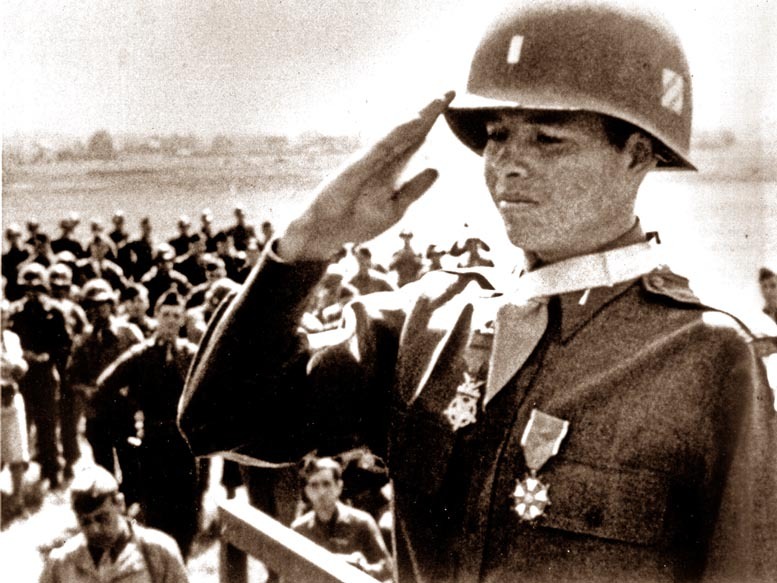 When I was in college, I wrote a paper on Audie Murphy for history class. Murphy was a real American hero, the most decorated combat soldier of World War II. He held off an entire squad of German soldiers alone, armed with a machine gun and bleeding from a leg wound, under fire from both foot soldiers and tank fire. Then he rejoined his men and led an attack on the Germans, driving them back and earning the Medal of Honor for his valiant efforts. Murphy was noticed by Hollywood upon his return from the war, and soon was cast in a successful series of Westerns: THE KID FROM TEXAS, KANSAS RAIDERS, DUEL AT SILVER CREEK, RED BADGE OF COURAGE, GUNSMOKE, and a remake of DESTRY. His autobiography TO HELL AND BACK was a national best seller, and Audie played himself in the film version. 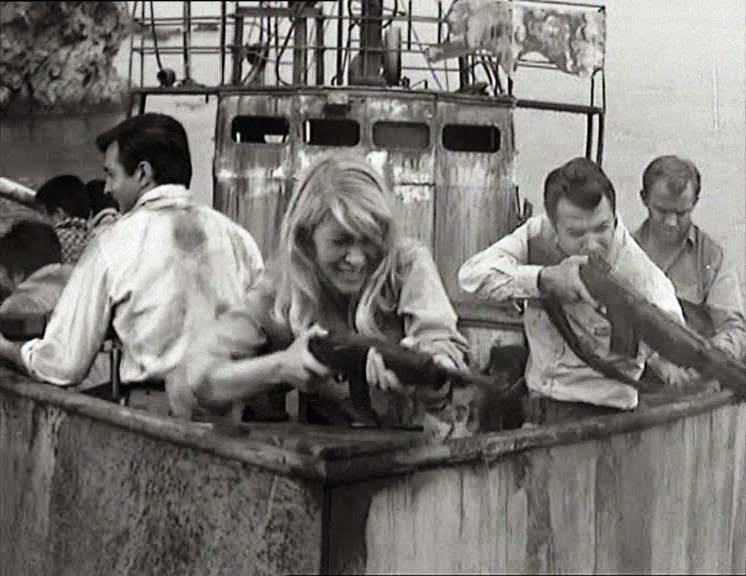 Surprisingly, Murphy only starred in one other war film, 1961’s BATTLE AT BLOODY BEACH. Audie’s fighting the Japanese in this one, as Craig Benson, an American who was separated from his wife Ruth when the Japanese took over the Philippines. Since then, he’s spent the past two years working with the U.S. Navy, helping to arm guerillas and searching for Ruth in the process. 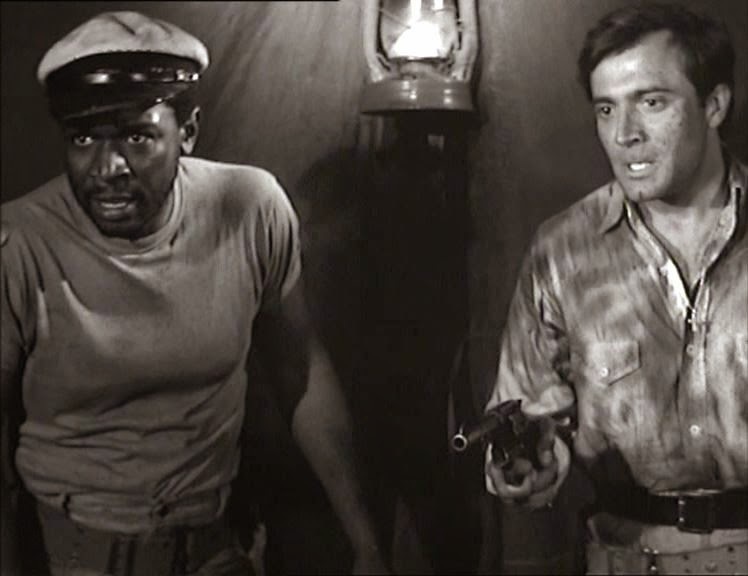 Benson’s dropped off with a shipment of arms on one of the islands, where he’s met by Army sergeant Sackler, who lends him his guide Blanco to search for rebels. Benson and Blanco are ambushed by the insurrectionist army of “General” M’Keever, who wants the arms Benson has brought. Benson doesn’t trust the wily general, and with good reason. M’Keever pulls a gun on Benson when, out of nowhere, Julio Fontana and his own rebel army attack the camp. 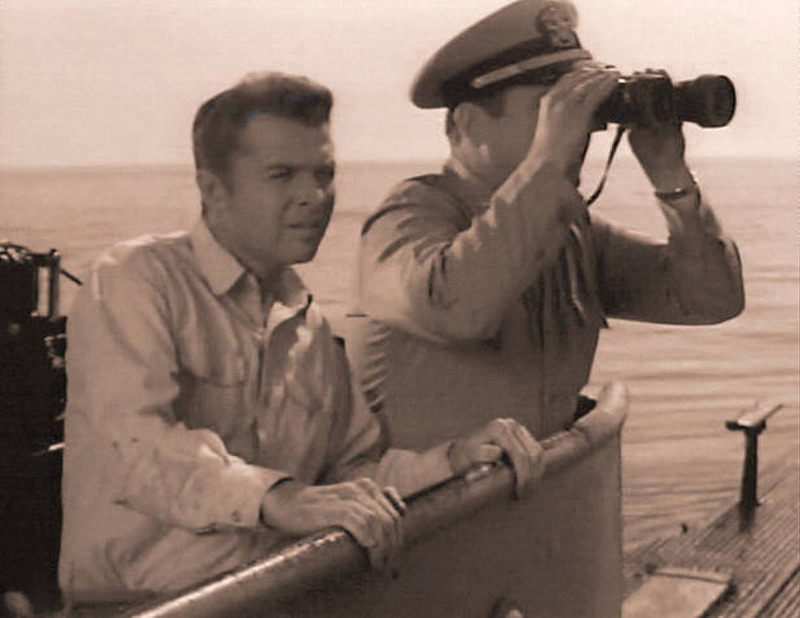 After rescuing Benson, Fontana tells him he has seven Americans hiding out with him. Benson says needs to get the Americans to safety, and he’ll give Fontana the arms to battle the Japanese. But to Benson’s shock, one of the Americans is Ruth. 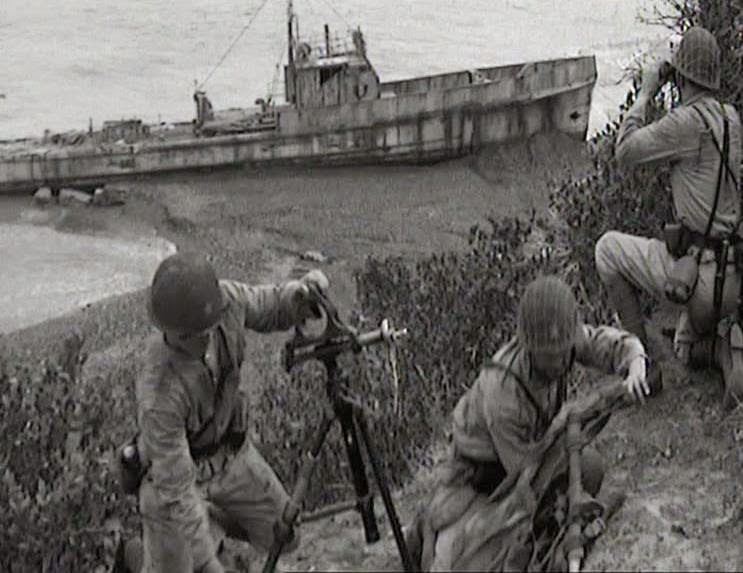 Benson leads Fontana, Ruth, the Americans, and a few fighters across the dangerous terrain to the shore where the arms are kept, while Fontana’s right hand man Tiger Blair and the rest wait behind. What Benson doesn’t know is Ruth and Fontana are now an item, as she thought him long dead and joined with the freedom fighters. They arrive back at the shoreline, where the arms are stashed in an old wrecked ship, when they’re suddenly surrounded by the Japanese army, and now must fight for their lives to survive despite insurmountable odds. 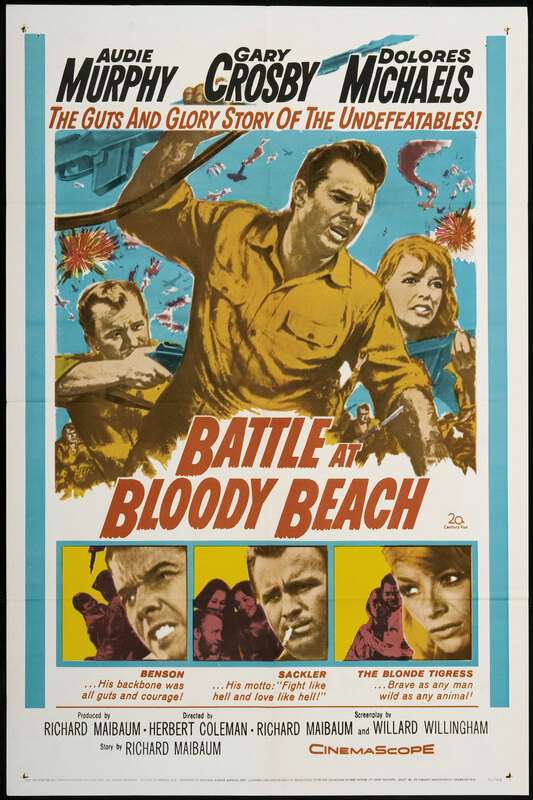 BATTLE AT BLOODY BEACH is a great title, but the film’s only so-so. 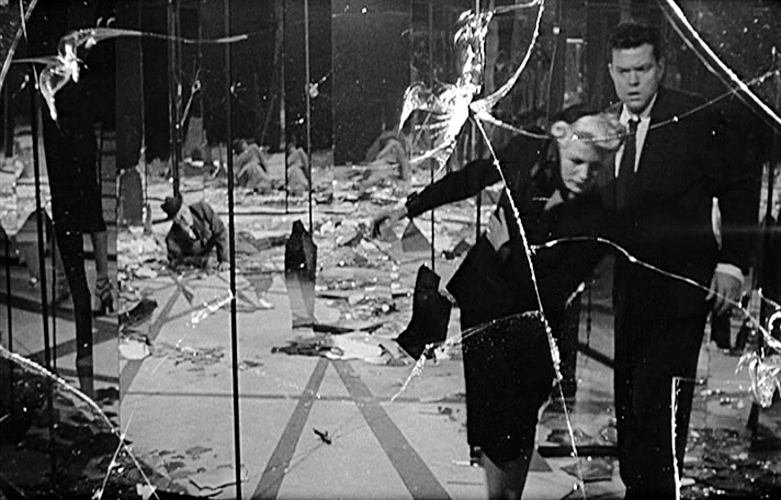 Although there are some flashes of violence in the beginning, the “battle” doesn’t really get started until we’re about two-thirds of the way through. It’s talky and melodramatic, spending too much time on the love triangle and not enough on the battle. Audie Murphy had great screen presence, but truthfully he wasn’t so great as an actor. Given the right material, like in RED BADGE OF COURAGE and NO NAME ON THE BULLET, he excelled. Unfortunately, this film doesn’t give him much to work with, and the result is, except a few brief moments, rather tame. The supporting cast consists of mainly Familiar Faces from the ranks of television. Dolores Michaels (Ruth) was a B starlet of the 50’s who ended her career in episodic TV. Alejandro Rey (Fontana) makes his American film debut here, and he’s good; his best known role was Carlos Ramirez, friend of THE FLYING NUN. Gary Crosby (son of Bing, ADAM-12) plays Sackler, and winds up getting eaten by a shark for his troubles! Ivan Dixon (Tiger) is better known as Kinch on HOGAN’S HEROES. William Mims, who’s flamboyant as M’Keever, popped up all over episodic TV in guest spots. One of the Americans, the wounded Jeff, is Barry Atwater. If that name rings a bell, you’re probably a horror fan, as Atwater portrayed the vampire Janos Skorzeny in the classic TV Movie THE NIGHT STALKER. Director Herbert Coleman was associated with Alfred Hitchcock as an assistant director and producer. Producer/screenwriter Richard Maibaum’s credits stretch back to 1936’s WE WENT TO COLLEGE, but film buffs will surely recognize his name as writer of 13 James Bond movies, beginning with the first, DR. NO. BATTLE AT BLOODY BEACH isn’t the most exciting war film, but it has its moments, and it does star a real war hero, Audie Murphy. Today, while you’re at your family cookouts, take time to remember men like Murphy, who gave so much to this country in the service of freedom. We owe them a huge amount of gratitude. Even in these crazy, divided political times, there’s no country I’d rather be a part of than the United States of America!